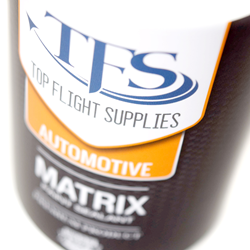 This week Top Flight Supplies introduced their new Matrix Paint Sealant for cars, trucks and recreational vehicles. The sealant creates a brilliant shiny finish, lasts two and half times longer than wax and protects finish from car wash processes, winter road chemicals and UV degradation. Top Flight Supplies parent company Top Flight Detailing, has been in the aircraft detailing business for two decades and was unhappy with products previously available. They were determined to create a far better sealant that could withstand the exceptionally high demands needed for jets that travel in the harshest of environments. To differentiate their business, Top Flight Detailing needed to find a product that lasted longer than the leading brands. So they set about developing their own sealant, testing and re-testing until they were satisfied that they could put their name on it. Now after 10 plus years of experience, Top Flight Supplies is introducing an automotive product that shares the nano-technology of their flagship aviation product. "If you can create a paint sealant that works well on jets, you've got a technology that will work incredibly well on cars, trucks and RV’s. Our Matrix Auto Sealant performs better than anything else on the market," said Jeff Lindstrom of Top Flight Supplies. The sealant makes automotive surfaces far easier to clean. Water beads easily and finish is protected from UV rays and corrosion. The product is intended for application by individuals and professional services. It can be applied by hand, orbital buffer, dual action polisher and rotary buffers. "Once you have Matrix on your car, future washings are much easier. Dirt and grime come right off and your finish looks like new. The value of your car or truck is preserved, making an affordable bottle of Matrix your best investment," Lindstrom said. Matrix Auto Sealant comes in a big 16 ounce bottle. It is an off white liquid that goes on with a high bonding property. This leads to less washing and fewer reapplications. "We use reactive polymers and resins which create the longest lasting protective coating on the market,"Lindstrom said. Matrix Auto Paint Sealant is available on Amazon. You can find help videos and more information on the company website, http://www.topflightsupplies.com.